The usefulness of quantum computers is directly related to the size of the quantum registers. A critical issue for the successful implementation of a quantum computer is that the quantum information, which is stored in coherent superpositions of the qubits, is not lost before the quantum computation has ended. The term decoherence summarizes all processes that lead to a decay of quantum information by the coupling between the quantum register and its environment. There are a number of proposals for potential candidates to accomplish the building of a scalable quantum computer. For these systems, it is often possible to estimate the quantum gate operation times, but much less is known about the decoherence. The decoherence times have been measured or estimated only for individual qubits. In this project, we want to determine the scaling of decoherence in large quantum registers. To perform these measurements, we have implemented model quantum registers consisting of up to 5000 nuclear spin qubits (protons in a powdered adamantane sample) and measured the decay of the correlated states. To create the correlated spin states, we modify the dipole-dipole coupling between the spins by means of a multiple pulse sequence [1,2] that is applied during the correlation period of the experiment (Fig. 1). 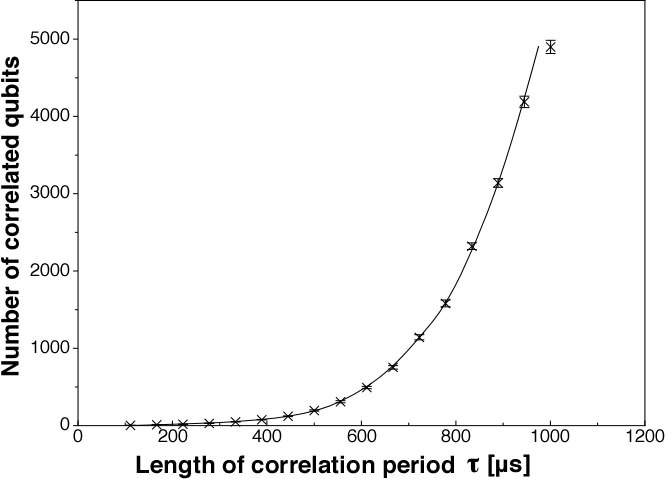 The size of the quantum register can be adjusted through the length of the correlation period tau (Fig. 2). After the creation of the correlated states, we let them decay under the dipole-dipole coupling, which is by far the largest interaction between the spins in our system. To measure the amount of information that is stored in the quantum register after the decay, we use a method introduced by Yen and Pines . It converts the unobservable multiple quantum coherences back into single spin magnetization that we measure as a free induction decay (FID). For every quantum register size, we measured the decoherence rate for the case of free evolution (decay due to dipole-dipole coupling in the evolution period), and compared the results that we get if we decouple the spins during evolution by means of suitable multiple-pulse sequences [6, 7]. We define the decoherence rate as the inverse of the 1/e decay time of the FID heights for different values of the evolution time t 1 . 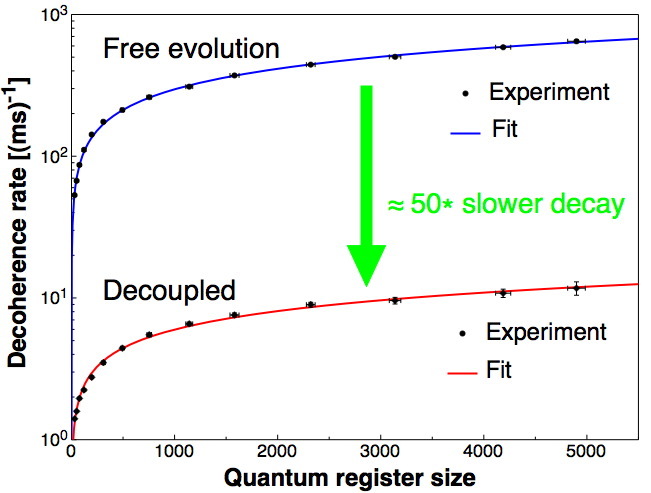 The results in figure 3 indicate that it is possible to sustain the quantum information by a factor of 50 longer under decoupling compared to the free evolution, independent of the size of the quantum register. The use of suitable single qubit rotations for decoupling of the quantum register and its environment works well in our system. In addition to this, the scaling of the decoherence rates increases with the quantum register size, but less than linear with the number of correlated qubits .